My books, which are written in finnish, aren´t translated - yet. 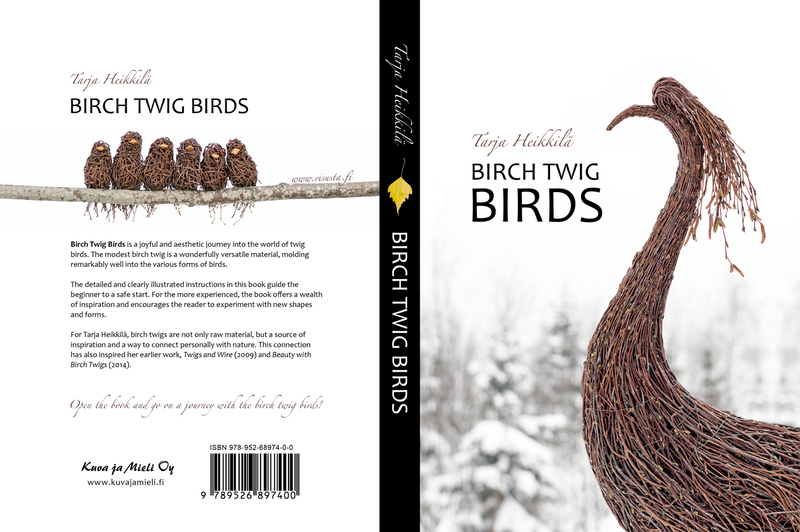 Birch Twig Birds is a joyful and aesthetic journey into the world of twig birds. The modest birch twig is a wonderfully versatile material, molding remarkably well into the various forms of birds. The detailed and clearly illustrated instructions in this book guide the beginner to a safe start. For the more experienced, the book offers a wealth of inspiration and encourages the reader to experiment with new shapes and forms. 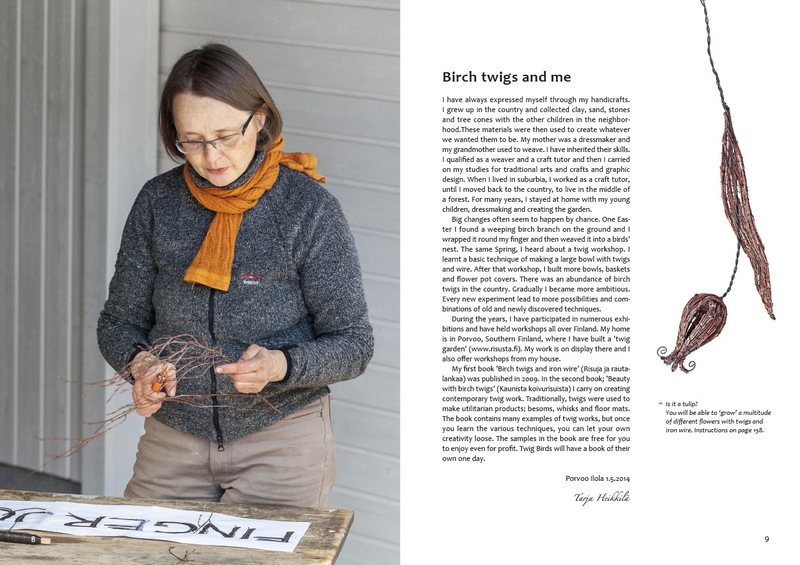 For Tarja Heikkilä, birch twigs are not only raw material, but a source of inspiration and a way to connect personally with nature. This connection has also inspired her earlier work, Twigs and Wire (2009) and Beauty with Birch Twigs (2014). The book is full of pictures and ideas and has easy and more challenging instructions for them. It invites you to combine techniques and even lark around. 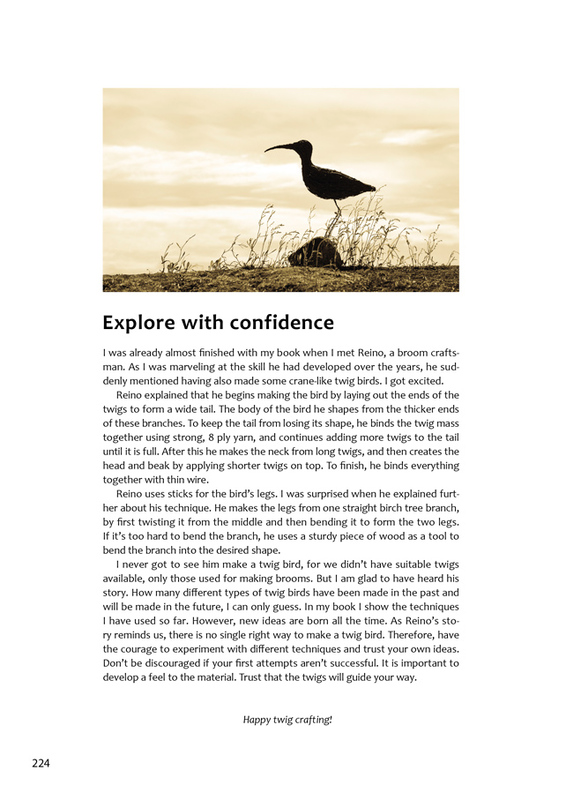 The book inspires experimentation and encourages creativity. Clear instructions help you to achieve the techniques twig by twig. And best of all, twig work is inexpensive. Birch twigs are collected during their leafless cycle and they are ready to use straight after collection. In addition to twigs, you will need iron wire and some basic tools. 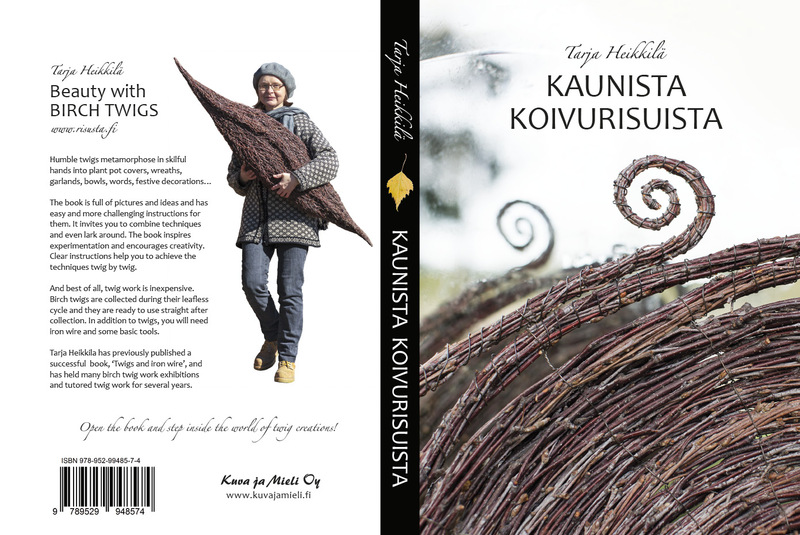 Tarja Heikkila has previously published a successful book, ‘Twigs and iron wire’, and has held many birch twig work exhibitions and tutored twig work for several years. After teaching Design and Technology in England at secondary schools for 12 years, I felt it was time for a change. But I needed something else to do. I am a dedicated crafter. I believe that making products with my hands has many positive effects on my life. I am not happy unless I have a fire in my belly about something I’m going to make. I love having my hands active, I adore different traditional and new materials and equipment and I get a huge sense of satisfaction from the products I make. The difficulties in making process keep my mind thinking and searching. My thinking and searching lead me to Tarja. When I saw Tarja’s book ‘Twigs and iron wire’ on the internet, I knew I had found focus for what I was going to do next. I was amazed by the quality, versatility and beauty of Tarja’s book. Birch twigs felt the right thing to explore and I had found a very qualified tutor. I wanted to be a tutor myself and bring in other people to convince them of the birch twig craft. As you can already tell, I wanted to run before I learned to walk. I live in East Yorkshire and even though we have an abundance of birch trees it is not considered polite behaviour to go and snip branches of any birch tree one passes by. I needed a supplier. I found two reliable, kind souls who have been my saviours for the supply of workshop twigs ever since. I started running workshops based on Tarja’s book in December 2012. I had asked her permission as I felt very cheeky for using her ideas so blatantly. Her generous permission was received with relief. Every time when I take a workshop I think of Tarja with huge gratitude. Not just because she has offered me a lovely craft but because I can share it with so many other enthusiastic people. 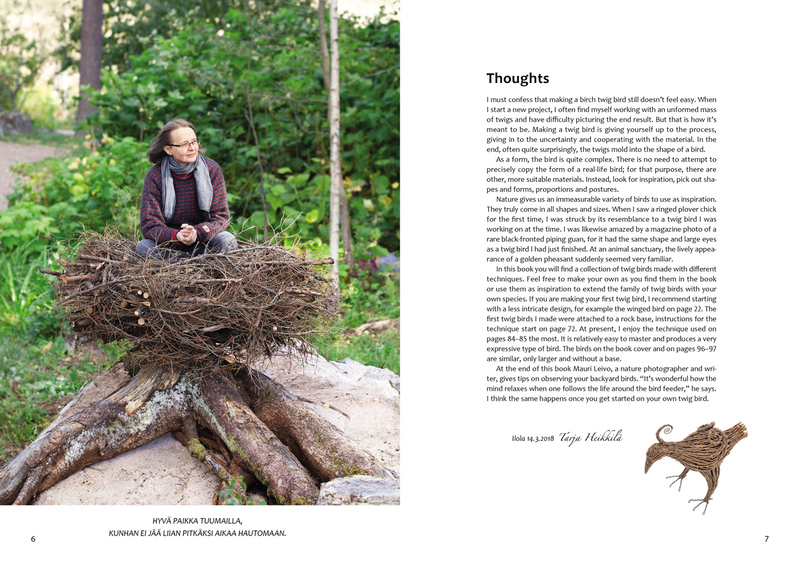 I went to Illola, near Porvoo to Tarja’s house to learn from the master during the summer 2014. I was able to see all her work in the house and garden. All of Tarja’s work emits careful consideration for the material, environment and aesthetics. I found her instruction encouraging and skilful. Tarja’s work fits in the nature and contemporary surroundings equally well. I loved seeing the attention Tarja pays to detail without losing the bigger picture. Working with Tarja and birch twigs has enriched my life.